It’s springtime, and that means, the flowers are blooming, and the weather is warming. Pretty soon, you’ll be making plans for more outdoor activities with friends and family, making memories with plenty of photos to mark the occasions. Wait, did I say photos? Yes, I did. That means, you need to make sure your teeth are prepped and ready to go, so you can have a bright and shining smile in all those pictures. 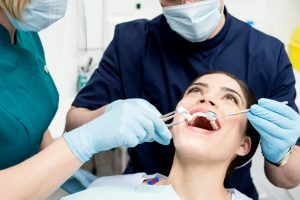 To get ready for Spring, find out from your dentist in North Raleigh why it’s important to get regular dental cleanings. By brushing twice a day for two minutes and flossing daily, you can prevent cavities from forming in your mouth. But, if your diet consists of a lot of sugar, and you fluff off the idea of maintaining a good oral hygiene routine, you’ll be looking at having quite a few cavities filled at your next appointment. By attending your regularly scheduled dental appointments, your dentist can look at each tooth to ensure it’s in good shape and cavity-free. A good dental cleaning always leaves you with a bright, shining smile. It’s no wonder so many of us walk out with our tongues gliding back and forth across our teeth, only to get into the car and pull down the visor to take another look at our pearly whites. The tools used during a general cleaning can remove stains caused by drinking all that coffee at work! Maybe it’s time to switch to water? If bacteria and plaque are allowed to grow above and below the gum line, the likeliness that gingivitis will develop is strong. If caught early, you and your dentist can work together to get rid of the build-up and keep it off with good oral habits. However, if you allow it to worsen, you may be faced with periodontitis, which is a more advanced form of gum disease that can cause your gums to bleed and teeth to loosen or fall out. It even causes bone loss. With gum disease comes the potential for losing teeth. When your teeth fall out, you have two options, and one is strongly discouraged: leave it alone or get it replaced. A missing tooth can be replaced with a dental restoration, which is highly advised. However, if avoid getting it replaced, your jawbone can begin to deteriorate, making it easier for other teeth to fall out. In addition, these vacated sockets can cause other teeth to begin shifting and cause additional problems with your facial appearance. If you commit to going to the dentist every six months for a regular cleaning, you will be saving yourself a lot of money. You may find it hard to believe, but by maintaining a good routine at home and allowing your dentist to check your teeth and gums for any problems, your preventing the need for future restorations or dental surgery due to bad habits. Use your money on that special vacation you want to take with your husband, not a root canal! Keep all the items mentioned above in mind when you begin to contemplate going to the dentist. No longer than a general cleaning takes, you can save yourself a lot of trouble (and money) in the future. Dr. Philip Lisk earned a Bachelor of Science in Zoology from North Carolina State University before earning a Doctor of Dental Surgery from the University of North Carolina School of Dentistry in Chapel Hill. He and his team of experts strive to ensure you are comfortable and at ease during your appointment. In addition, their office offers advanced therapies and procedures, so you receive the best results. To learn more, contact us at (919) 870-6892.